Until today, Gmail hadn’t been updated since January 2016. That’s a long time between updates for a major Google service. Meanwhile, Inbox, Google’s other email client, has been repeatedly updated throughout 2016. That led me and others to wonder whether Google was abandoning its more traditional email client for Inbox’s cutting-edge features. Although Gmail appears to be on a slower update cycle than Inbox, today Gmail received a handful of solid new features and a design update that breathes fresh life into the app. 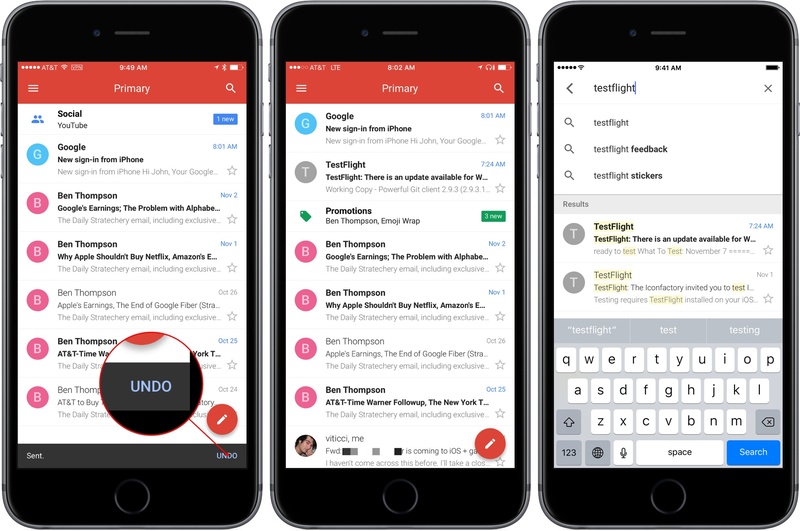 Gmail’s new design brings it much closer to the UI of its Android cousin and other Google apps available on iOS. The design is colorful, uncluttered, and easy to read with a compose button right where you expect it in a Google app. Google also added the ability to quickly archive or delete messages with left or right swipe gesture from your inbox. By default, Gmail is set to archive when you swipe on a message, but you can switch it to delete messages in settings on a per-account basis. Gmail’s new ‘Undo Send’ feature gives you about five seconds to tap an Undo button in the lower right hand corner of the screen to retrieve a message that you didn’t mean to send. It would be nice to be able to adjust the length of the delay before a message is sent, but I suspect five seconds is enough in most circumstances. In addition, Google says it has made email search even faster. The speed and accuracy of Gmail’s search is the primary reason I keep Gmail installed. I don’t use Gmail regularly enough to comment whether the new search is faster, but in my limited testing search results appeared almost instantly on a good WiFi connection, even when retrieving months-old email. I’m glad to see Google pushing Gmail forward. With this update, it fits better aesthetically with the rest of Google’s iOS apps and adds features that keep Gmail on par with other iOS email clients. I only wish that Gmail also included a unified inbox option instead of requiring me to switch among multiple accounts. Gmail is available on the App Store as a free download.